The project has drawn scrutiny from lawmakers for its ballooning costs — now at about $8.8 billion, far higher than the initial estimate of $3.5 billion. "What the Webb will really be doing is looking at the first galaxies of the universe," Webb telescope observatory project scientist Mark Clampin told AFP at NASA's Goddard Space Flight Center in Greenbelt, Maryland. "We will also be able, with these capabilities, to look in very dark parts of the universe where stars are being born." Inside a massive room that is partially closed off from view, in clean room where no dust can harm the telescope, a team of engineers dressed in white, resembling surgeons, work on building the JWST. The space telescope will weigh 6.4 tons. JWST's main mirror will be 6.5 meters (yards) in diameter, three times as large as Hubble's. 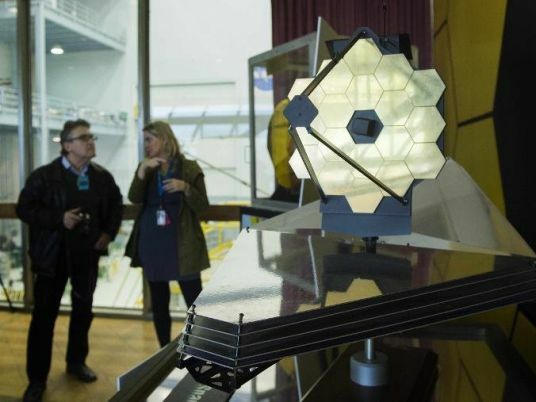 A joint project of NASA, the European and canadian space agencies, JWST will carry four instruments, including cameras and spectrometers that can capture extremely faint signals. Infra-red capability will help it observe distant celestial bodies, and its camera shutter will be able to remain open for long periods, explained Matt Greenhouse, JWST project scientist for the science instrument payload. "The Webb will have 70 times the light-gathering capacity of Hubble. So the combination of the large size and the infra-red capabilities will allow us to observe this epic of the universe past," he said in an interview. Even more, the telescope should further the search for life elsewhere in the universe by opening a new window on planets outside the solar system — known as exoplanets — that might have water and orbit their stars at a suitable distance to prevent freezing or boiling. "Webb is quite big enough to have a high probability of finding bio signatures in the atmosphere of exoplanets, evidence of life," Greenhouse said. "We have sensors on board, equipment on board that will enable us to study the atmosphere of exoplanets spectroscopically. So we will be able to understand the composition of those atmospheres," he added. Unlike the Hubble Space Telescope, which circles the Earth, the JWST will go even further, to a place called L2, for LaGrange Point, 930,000 miles (1.5 million kilometers) away in space. That distance will keep the telescope cold, prevent it from being blinded by its own infra-red light and shelter it from radiation. "It will follow the Earth around the Sun over the course of the year. So it's in a Sun center orbit instead of an Earth center orbit," said Greenhouse. "Just as Hubble rewrote all the textbooks, Webb will rewrite it again," said Greenhouse.